Built specifically for Powder Coating, these ovens incorporate everything other manufacturers call their "top of the line" product. Features, such as +15X air changes; thorough air mixing not only from side to side, but top to bottom; heavy duty construction including outer support structures (not buried into the walls which decreases your insulation effectiveness); extra heavy wall panels and ductwork; and enhanced controls for accurate results with each batch. 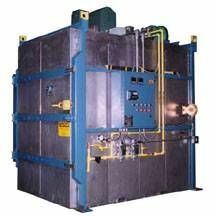 Aerospace Oven — This powder coat-drying oven is used in the manufacturing of specialty built aircraft parts. The oven is an intricate part of the complete coatings system supplied by BJS Enterprises, Inc. to the customer. This oven was built and shipped in modular form to accommodate a limited manufacturing space at the customer's plant. Access to the coatings room was limited to a small 6' x 8' doorway. This example shows that, no matter what the obstacle may be, I.C.E. can work with the customer to meet the customer's specific needs. 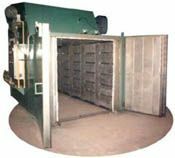 Industrial Walk-in Paint Drying Batch Oven — The adjustable air vanes provide excellent temperature uniformity, regardless of load configuration. Continuous Conveyor Oven with a temperature range of 200°F to 800°F. This product is available in gas or electric custom designed to your specific requirements. It is typically used for the drying of machined parts (metals, ceramics, fiber, etc.). Car Bottom Refractory Curing Oven with a temperature range up to 750°F. This industrial oven is equipped with a heavy duty flow-through car. This type of system was used for drying large refractory shapes. Industrial Powder Coating Oven with a typical temperature range of 400°F - 500°F. This powder coat system comes in batch or continuous lines. It is typically used for powder coating of OEM items (i.e., electrical cabinets, automobile, motorcycle, and boat parts).